OK so some people might look at this and think it’s just a box, but when you stop and think that 2 hours ago this “box” had never before existed in the entire span of human history, and that it was made on my desk, with a printer, well that’s pretty cool! That might be over-dramatising things just a little, but there really is something very rewarding about 3D printing a custom enclosure to contain your electronics. I have quite the collection now, for example an Arduino enclosure and a Wiiduino. In this particular case a custom PCB has been manufactured, and we need to contain it in something for trials, keeping all the wires and mess tidy and giving the appearance of a real wearable product as it one day could be. The PCB is about the size of an Arduino Uno, with a lithium battery that needs to be housed inside as well. I started by modelling the PCB in Solidworks, just as I have done in previous projects. While many people would only bother creating a simple block model of the overall dimensions, I’ve gone to the trouble of accurately modelling all of the key components like LED’s, buttons and connectors as shown above. This means that in the enclosure design, I’ve been able to play with form, giving the design tapered edges to make it seem slimmer, and accurately place holes and details for the various components. In doing so, the first 3D prints fitted successfully, saving time stuffing around later. These were printed on my Cocoon Create, which is still going along nicely, thanks Aldi! I’ve also opted to use 2 screws to secure the enclosure halves, as snap details on such small enclosures can be fiddly when using desktop 3D printers – if you don’t print them in the right orientation, they just snap off. With holes already placed on the PCB, it makes sense to use these to both secure the 2 shells, and hold the PCB in place. So you get the full picture, here’s the 3D model for you to spin around. Lastly my tip is to always add some sort of logo or name to the enclosure – it just makes it really pop, and takes no time at all to add. Even a rough prototype should look good! Mesostructure… Is that a real word? It sure is, and while the definitions are quite complex, the best way to understand a mesostructure is to look at some images of them. The top left photo is actually a nice 3D print of one you can download free from Thingiverse, and if you’re after something to show people the interesting things that can be 3D printed, this is a great example. I’ve printed them in ABS plastic, but the structure itself is both rigid and flexible. 3D modeling them can be a good little challenge – hopefully whatever CAD program you’re using has some great patterning and mirroring tools! I used Solidworks and really made the most of the parametric functions to allow quick and easy changes in the future. By changing the density of the structure, or simply increasing the thickness of them, you can really play around with the flexibility of the structure. The other 2 images are actually my first little attempt and having a functional use for a mesostructure. I’m trying to isolate some small vibration motors, and this was one of the ideas building upon a previous round of prototypes that I’ve posted. It’s just like building in some springs between each motor. Nice and flexible and only 25 minutes to 3D print on my Cocoon Create, which is great when you’re trying to test and iterate multiple ideas quickly. Below is the 3D model for you to spin around. The individual cells won’t get so large that they overlap. At their maximum size they will maintain a small gap from each other. The grid itself is also parametrically controlled, so spacing can be modified using 2 sliders, or expanded to include more elements. The length of each extrusion is directly related to the area of each individual hexagon. Below is the way I created it in Grasshopper. This is such a powerful tool and I’m still only just scratching the surface. Hopefully over the coming week I’ll get to playing around with the Firefly plugin that pairs with my Arduino. If I could control the 2 attractor points in this model from the Arduino for example, that would be pretty amazing! Things are starting to come together and I could not be more excited! 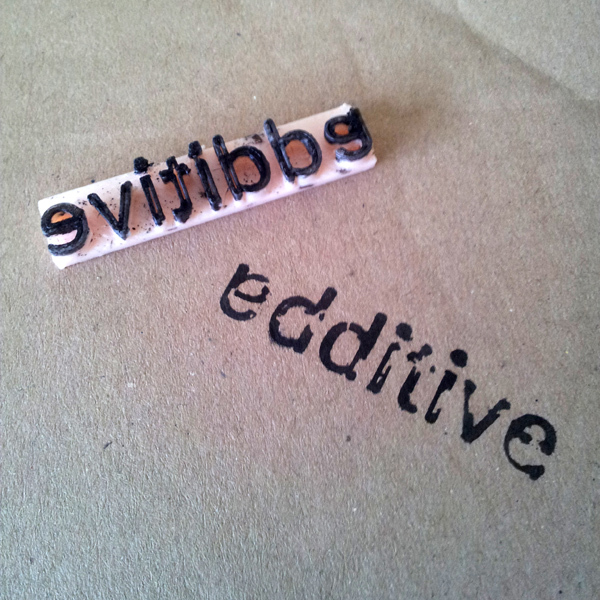 I’ve just made my first stamp using the ‘edditive‘ 3D printed logo and some ink on cardboard – PERFECT. I know stamping is such an old technology but there is something extremely satisfying about testing an idea like this and having it turn out exactly the way you want. And all designed and 3D printed within 30 minutes – now that’s the power of 3D printing.